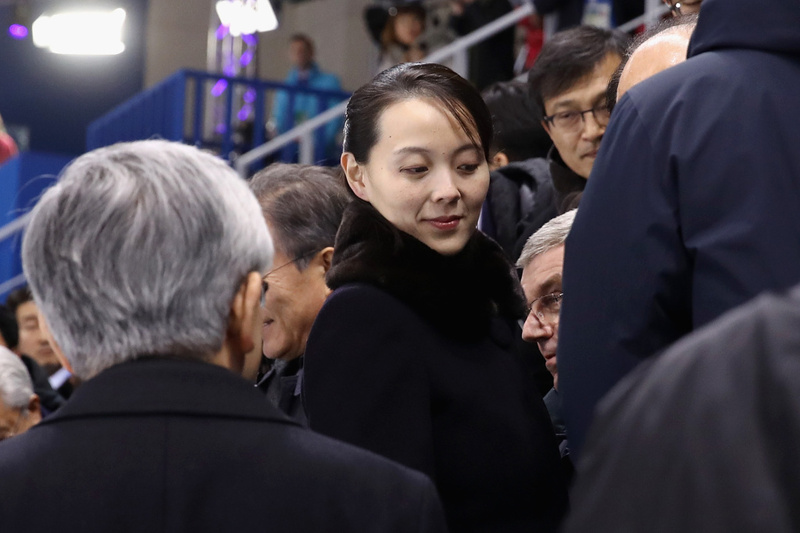 Kim Yo-jong, sister of North Korean leader Kim Jong-un, attends the Women's Ice Hockey game between Switzerland and Korea on the first day of the PyeongChang 2018 Winter Olympic Games on February 10, 2018 in Gangneung, South Korea. She's not what we expected: not stiff, but smiling. That's what people are saying in South Korea, as they consider the unprecedented visit by Kim Yo Jong, the sister of North Korean leader Kim Jong Un, who has raised her profile dramatically at the Pyeongchang Winter Olympics. Kim has captivated media attention and fascinated the public since her arrival on Friday. Days later, TV news shows in South Korea are still repeatedly airing footage of Kim walking with President Moon Jae-in, often with a placid smile on her face. Hoping to discern what she's thinking, analysts pored over video of her eyes, and remarked on the tilt of her chin. In South Korea and beyond, commentators are taken with Kim's surprisingly stylish and relaxed demeanor. Wearing a black coat and with her hair pulled back, she presents a marked contrast to the ceremonial head of North Korea's government — the often expressionless Kim Yong Nam, 90. Kim Yo Jong is 28 years old, according to the U.S. government. 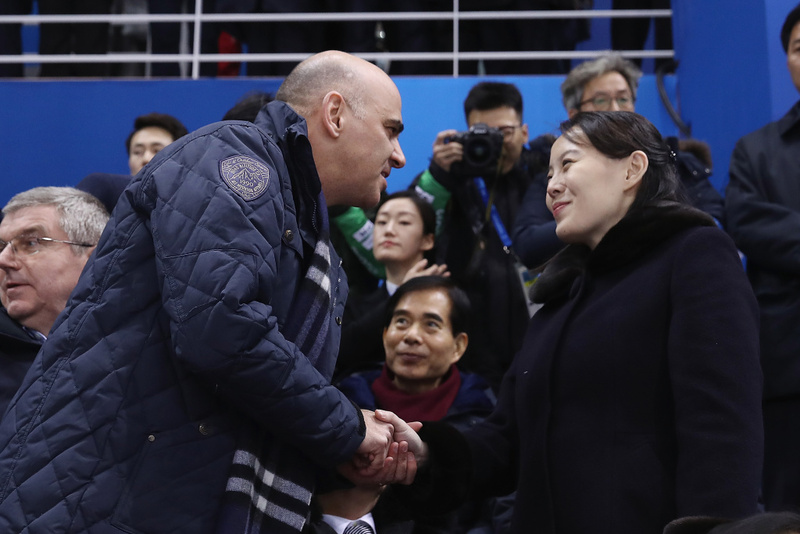 Swiss President Alain Berset shakes hands with Kim Yo-jong, sister of North Korean leader Kim Jong-un, during the Women's Ice Hockey game between Switzerland and Korea on day one of the PyeongChang 2018 Winter Olympic Games on February 10, 2018. Most notably, Kim sat directly behind U.S. Vice President Mike Pence at Friday night's opening ceremony in Pyeongchang, creating the unique image of two top officials whose governments have been locked in a loud argument, suddenly seated just feet away from each other. The two did not interact — although Pence, who arrived late, greeted the other dignitaries around him — prompting criticism of the American vice president. Kim Yo Jong is the first member of her family to set foot in this country since the north and south were divided and her grandfather, Kim Il Sung, founded North Korea. But rather than presenting herself as a stiff party operative, she has looked engaged and interested during multiple outings in Seoul, Pyeongchang and Gangneung. It's by far the most sustained public presence for Kim, who had been something of a mystery to many South Koreans, despite her known role in North Korea's politburo. Before now, she had been seen mainly in photos, but often in the background, as her brother took center stage. Her visit comes one year after the U.S. Treasury Department placed sanctions on Kim for her role in propaganda and "agitation" as part of her family's harsh rule over North Korea, and her government's efforts to develop nuclear weapons. 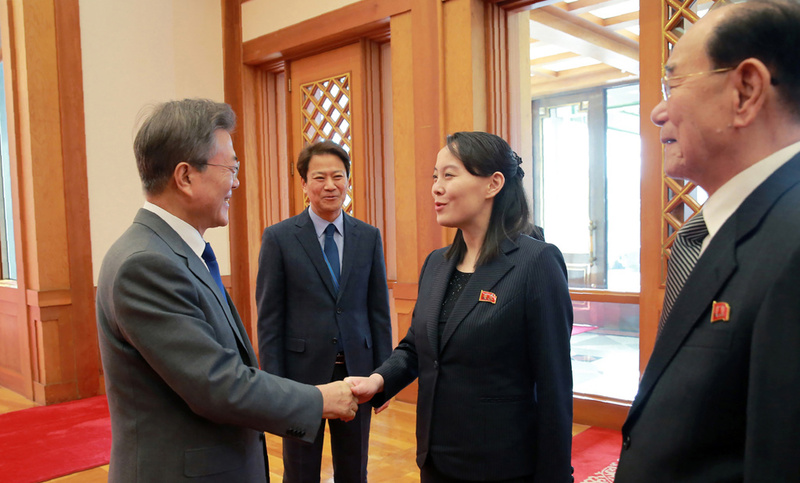 South Korea's President Moon Jae-in (left) greets Kim Yo Jong (center), the sister of North Korean leader Kim Jong Un, as North Korea's ceremonial head of state Kim Yong Nam (right) watches on February 10, 2018.. It was already known that Kim Yo Jong is an adviser to her brother; now many are interpreting her presence here — and the freedom with which she seems to behave — as new signs of the power she holds. One telling incident came early. After Kim arrived at Incheon Airport and met with the Korean unification minister, Kim Yong Nam gestured for her to take the center seat at the table — leading many South Korean news outlets to conclude that she's essentially her brother's second in command. Camera flashes; mobs of reporters: Through it all, Kim has maintained a placid smile — and despite Pence's stated intention to reinforce North Korea's isolation during his Olympic visit, the sister of the repressive regime's leader seems to have spent at least as much time with Moon as Pence did. President Moon hosted Kim at the presidential mansion for lunch on Saturday — a session in which Kim extended an invitation for Moon to visit North Korea later this year. They also made plans to attend a concert together on Sunday, to see a North Korean orchestra perform in Seoul. Pence left South Korea Saturday night, flying out of Pyeongchang after attending a short-track speedskating event with Moon — who then went to watch ice hockey along with Kim and the North Korean delegation. IOC President Thomas Bach, North Korean ceremonial head of state Kim Yong Nam and Kim Yo-jong, sister of North Korean leader Kim Jong-un, attend the Women's Ice Hockey game between Switzerland and Korea on day one of the PyeongChang 2018 Winter Olympic Games on February 10, 2018. 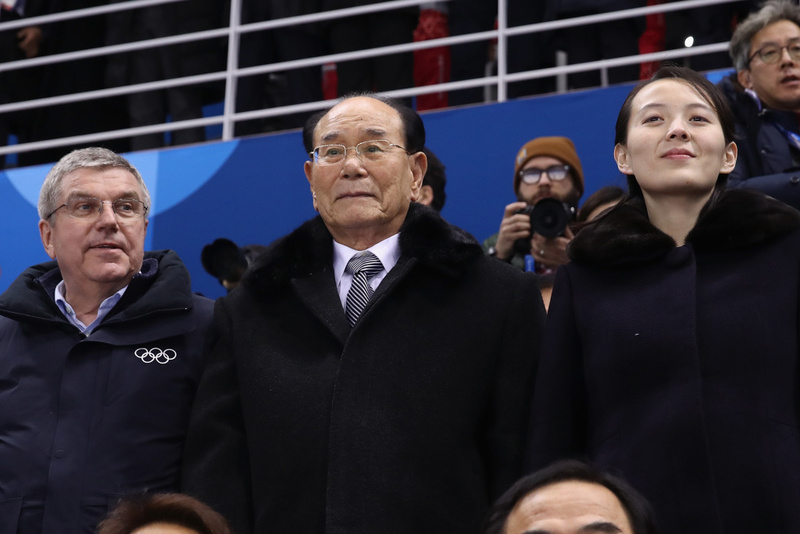 At the the Olympics' opening ceremony on Friday night, Kim Yo Jong sat behind Moon (and Pence) – but Saturday night, she and Kim Yong Nam sat next to Moon and IOC President Thomas Bach as they watched the unified Korean women's hockey team play their historic first game. After the game, the entire group walked around to the Koreans' bench to greet them and pose for photos. Also at that game: the famed cheer squad from North Korea — more than 100 identically dressed women who sing, perform choreographed moves and cheer on their team. They've been called an element of the northern regime's "charm offensive" — a claim that's also been made against Kim Yo Jong during this visit. Are these Winter Games having the effect South Korea had hoped, in thawing relations with the north? Will Kim continue her role as a conduit between the two countries, outside of the headline-grabbing language of threats — and beyond the photo-op diplomacy of this weekend? It's too early to tell (although skeptics are already shaking their heads at all of the above). Kim's presence at the Olympics has presented people in South Korea and beyond with something new to know about North Korea. 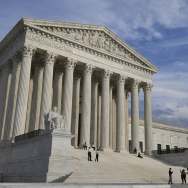 It's anyone's guess as to when we might learn what's behind the facade. 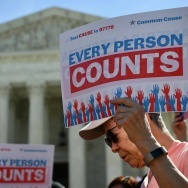 Se Eun Gong contributed to this report.